PARIS, France (CNN) -- The French trader accused of a multi-billion-dollar fraud at banking giant Societe Generale will go on trial next year, a lawyer for the bank said Tuesday. Kerviel faces up to five years in prison if convicted of fraud charges. Jerome Kerviel will face charges including forgery, breach of trust, and introducing fraudulent data into the bank's data system, Societe Generale lawyer Jean Veil told CNN. He faces a penalty of up to five years in prison and a fine of up to €375,000 euros ($538,000), Veil said. The bank also will ask that Kerviel reimburse them for almost 5 billion euros ($7.1 billion), "which probably he will not pay," Veil said. Kerviel, who is now free on bail, was arrested last year after Societe Generale unveiled trading losses of more than $7.2 billion. 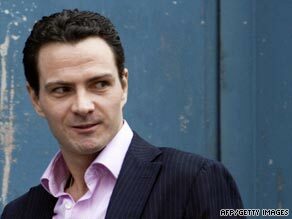 The bank attributed the losses to fraud by Kerviel, who traded European index futures for the bank. Kerviel is the only one charged in the case. His assistant, Thomas Mougard, was cleared of charges Monday, Veil said. Societe Generale believes Kerviel alone was responsible for the losses, which the bank announced in January 2008. Kerviel maintains he was not acting alone, Veil said. "The decision of the (court) confirms 100 percent the complaint of the bank, and that Kerviel was alone when he organized this massive fraud and that he was acting completely out of his (own accord)," Veil told CNN.